Belgian DJ Dr. Lektroluv is best known for his highly-acclaimed Lektroluv series electro compilations. This is his third release recorded live in an open-air party setting, following 2007's Live Recorded At Rock Werchter. 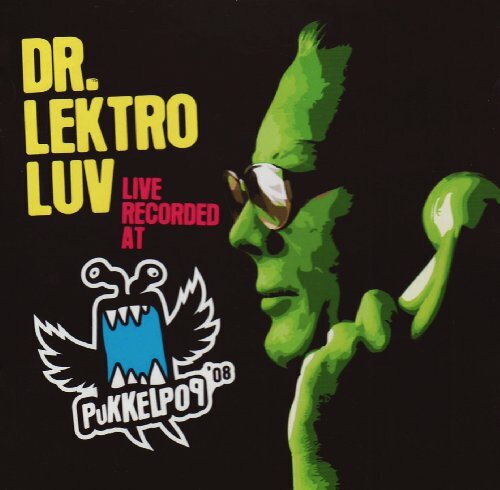 This time, the extremely popular green-masked Dr. Lektroluv offers you a recording of his set at the 2008 Pukkelpop festival, as the masked man of electro-funk closed the dance stage. Hot off the press, you can expect the fattest electro cuts from the hottest names around as the likes of Busy P, Jacknife Lee, Fischerspooner, The Count of Monte Cristal, Moby, Digitalism, Mr. Magnetik, Sebastian and Alex Gopher go toe-to-toe on the dancefloor. This three-day Belgian festival saw 210 acts playing to 152,000. The Live Recorded At Pukkelpop '08 mix is a new slice of electro fun that pitches today's current players with a sprinkling of brilliant old school classics. The good Doctor certainly knows how to rock the crowd as Mr. Magnetik's galvanized breaks segue into Machines Don't Care, Fischerspooner's electro evangelism gets re-rubbed by D.I.M. and the unstoppable pairing of "fidget house" kings Herve and Sinden as The Count of Monte Cristal has seen their "My Condition" become an instant classic. From Ed Banger stalwarts Busy P, Sebastian and Digitalism, we get the sound of France's electronic legacy while Moby and John Acquaviva show us that old techno dogs can still learn new tricks. From classic punk from The Subs to Williams' shiny new electro-house stylings and Alex Gopher's house take on electronics, it's all there, live and in the mix. Fusing angular rhythms, sleazy vocals, old and new, Dr. Lektroluv provides yet another vibrant selection for electro lovers everywhere. Pukkelpop goes green. Other artists include: Olivier Giacomotto, Switch, Foamo, Ampersand, Hey Today!, Crookers, Sound Of Stereo, Kid Cudi, Proxy, Hatiras & Jelo, Fake Blood, and Shinichi Osawa. If you have any questions about this product by Lektroluv, contact us by completing and submitting the form below. If you are looking for a specif part number, please include it with your message.